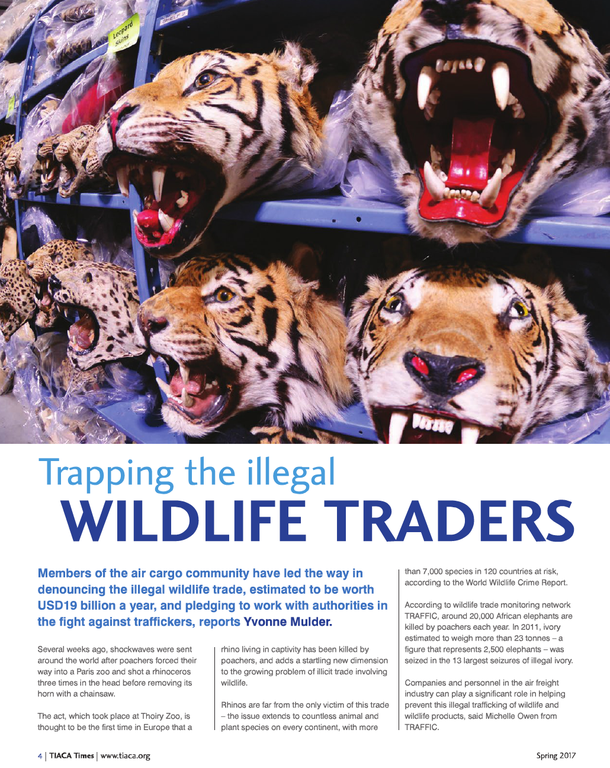 April 2017 - Members of the air cargo community have led the way in denouncing the illegal wildlife trade, estimated to be worth USD19 billion a year, and pledging to work with authorities in the fight against traffickers, reports Yvonne Mulder. Several weeks ago, shockwaves were sent around the world after poachers forced their way into a Paris zoo and shot a rhinoceros three times in the head before removing its horn with a chainsaw. The act, which took place at Thoiry Zoo, is thought to be the first time in Europe that a rhino living in zoo captivity has been killed by poachers, and adds a startling new dimension to the growing problem of illicit trade involving wildlife. Rhinos are far from the only victim of this trade -- the issue extends to countless animal and plant species on every continent, with more than 7,000 species in 120 countries at risk, according to the World Wildlife Crime Report. According to wildlife trade monitoring network TRAFFIC, around 20,000 African elephants are killed by poachers each year. In 2011, ivory estimated to weigh more than 23 tonnes -- a figure that represents 2,500 elephants -- was seized in the 13 largest seizures of illegal ivory. 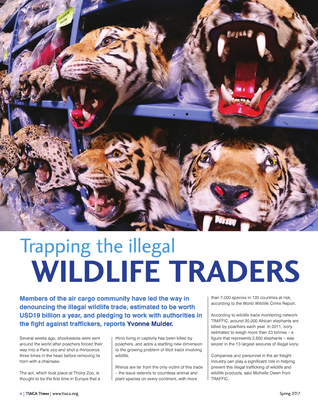 Companies and personnel in the air freight industry can play a significant role in helping prevent this illegal trafficking of wildlife and wildlife products, says Michelle Owen from TRAFFIC.